NEW YORK, New York — Fresh off the heels of his most recent trip to Armenia in February of 2011, Armenia Fund USA Board Member, Dr. Arthur Grigorian, took some time from his nonstop schedule to discuss the eight surgeries he performed during his visit to Yerevan State Medical University, eight unusual procedures that had never before been performed in the country. With the advent of Dr. Grigorian’s complex Armenian neuroscience program intent upon educating and training Armenian physicians, every such trip that Dr. Grigorian takes is a step toward changing the delivery of Armenian healthcare, bringing it up to the expectations taken for granted by those of us who have only ever been acquainted with the best of western medicine. In collaboration with Armenia Fund USA, the program saw its genesis in the desire to bring relief to victims suffering from acute strokes and hemorrhages. In Dr. Grigorian’s absence, residents continue to perform procedures, equipped with the knowledge and experience of having performed them alongside of him, his talented nurses and his frequent colleague, Dr. Arthur Ulm, of Louisiana State University. Additionally, Dr. Grigorian and Dr. Ulm perform post-surgery consultation via Internet-facilitated video conferencing, sharing the same concept as Armenia Fund USA’s HyeBridge Telehealth, a comprehensive educational, diagnostic and remote monitoring program. To complement the training neurosurgical residents receive by means of Dr. Grigorian and Dr. Ulm’s visits, the complex Armenian neuroscience program also arranges for fellowships with leading American universities and medical centers. There are currently two Armenian fellows in the States by means of this program, Ararat Minasyan and Tigran Khachatryan, both attending Louisiana State University but alternating their time there so one of them can still continue to deliver care at Yerevan State Medical University and to oversee the new procedures they learned and perform. Additionally, Haykanush Zakaryan, a neuroradiologist, will begin her three-month fellowship at Emory University at the end of the month before returning to Armenia to continue to work with and train others in this specialty. Such fellowships are above and beyond standard international exchange; the fellows as well as the programs are hand-picked with attention paid as to how to develop a well-rounded complex neuroscience program in Armenia. To this end, Armenia Fund USA is exploring an avenue into training neuro-anesthesiologists and intensive care physicians, a necessary component to the continuing advancement of neurosurgical procedures that Armenian healthcare is now equipped to offer. With a threefold approach of offering online lectures, consultation and post-operative critical care as it concerns anesthesiology, Dr. Rafi Avitsian, section head for neurosurgical anesthesiology with the Cleveland Clinic Foundation (CCF) in Cleveland, Ohio and program director of the neurosurgical anesthesia fellowship program, is in the process of commencing his involvement in this special program. As Armenia Fund USA’s complex Armenian neuroscience program continues to take shape, the students that benefit from this top expertise and corresponding fully-funded fellowships are not just the brightest Armenian doctors in neuroscience but also in the field at large, with their demonstrated achievement of obtaining placement in prestigious institutions and programs. Such achievement has not gone unnoticed. 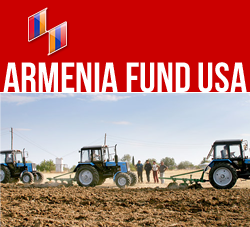 Armenia Fund USA recently became the recipient of a grant from Covidien, a leading global provider of healthcare products, through its Neurovascular Division. “The donation is in support of the newly created neuroscience facility in Armenia designed to bring best practices to physicians in the area and increasing access to quality care and treatment options for its citizens,” said David Mowry, President, Neurovascular Division, Covidien. Since 2002, around 30 Armenian medical students have received specialized training in the States via fellowships tailored precisely to the needs of the burgeoning Armenian neuroscience medical community. Dr. Grigorian and his team make four quarterly trips to Armenia to perform complex, cutting-edge neurosurgery and provide hands-on, ongoing training to YSMU’s neurosurgical residents. ARMENIAN MEDICAL FUND, USA (AMF, USA): is a not-for-proﬁt, non-sectarian, philanthropic organization established in New York State in 1953 with the sole purpose of aiding destitute Tuberculosis (TB) institutions in Armenia and the Middle East.